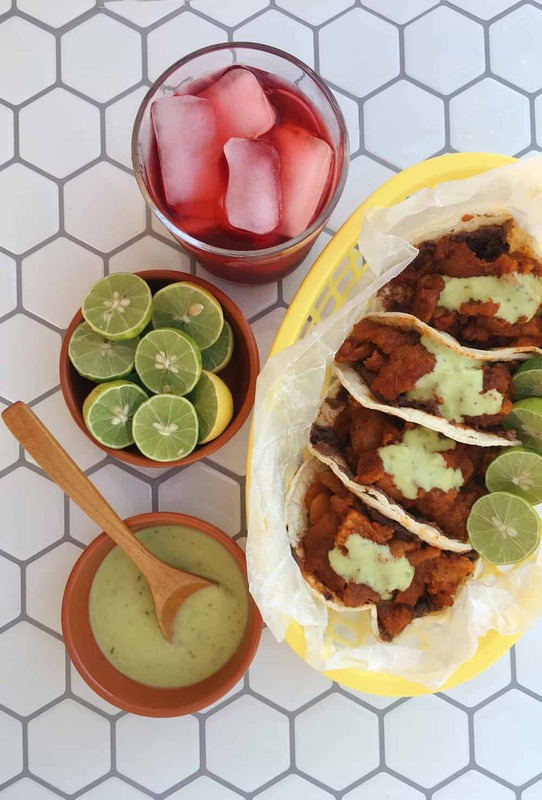 Chicharrón guisado is an easy, flavorful dish made from crunchy, fried pork skin stewed in salsa, and it makes incredible tacos. The best part about this dish is that it’s incredibly easy to make, packs a ton of flavor, and using a slow-cooker means it’s mostly a hands-off recipe. There’s a taquería in Los Angeles I really love called Guisados, and lucky for me, they have a location right near where I work. They make a taco de chicharrón guisado that’s very similar to this recipe, and they serve it on a corn tortilla over refried black beans, and topped with a little dollop of avocado salsa verde, which is how I served them here as well, but you can serve it without beans (or different beans) and whatever kind of salsa you like on top. There are lots of recipes out there for chicharrón guisado—mostly in Spanish—and there’s one key departure in my version aside from using a slow-cooker: I use chile morita, which is a small, dried and smoked chile. 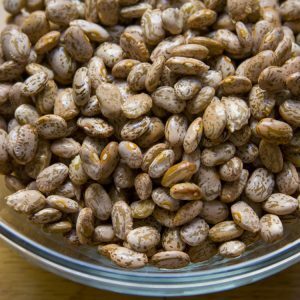 I also like to serve these on smaller tortillas (about 4.5 inches round instead of the standard 6 inches) because it makes you feel more like you’re in a taquería…. The holidays are coming and the weather’s getting cooler, which means I’m already starting my countdown to Christmas and las posadas Navideñas in Mexico. A few weekends ago, I attended the Kenmore blogger summit here in Chicago where I participated in a day of cooking challenges with some old and new food blogger friends. You can check out my team’s recipes at cookmore.com (but a heads up that they’re not Mexican recipes). My favorite team challenge was one where we had to create a beverage using a slow cooker. Naturally, I suggested we make a spinoff of my warm winter margarita recipe, but with a few modifications since tequila wasn’t an ingredient option. Our creation was a spiced brandy apple cider that wowed the judges and won us the competition; my guess as to why the recipe was such a success is probably because it had more than a little piquete of brandy, wink wink. I’ve been tinkering with some new holiday recipes recently, and the challenge inspired me to adapt a ponche de tamarindo recipe with brandy that I’ve been working on for the slow cooker. The punch has two tart elements: whole tamarind pods and flor de jamaica (hibiscus flowers), which are mellowed by the sweetness of the guava and piloncillo. 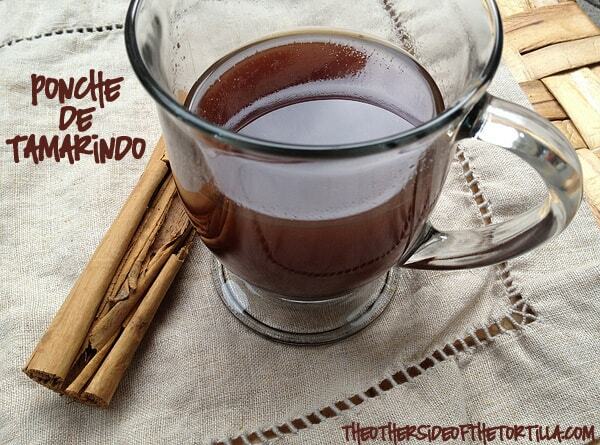 The cinnamon and brandy give a woody depth, and overall, it’s a satisfying drink to warm you up on a cold night. And of course, it’d be perfect to serve for your posadas…. 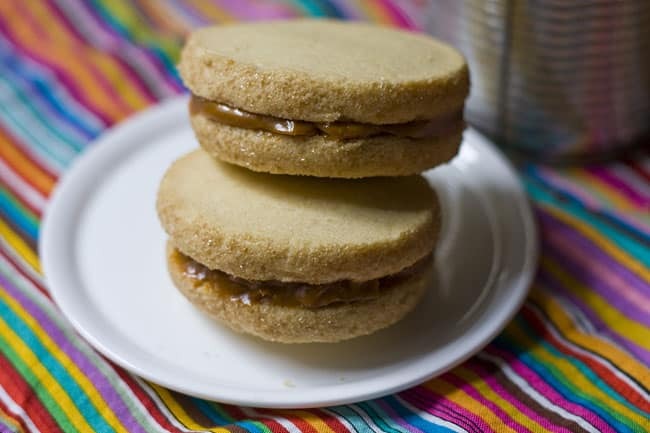 Alfajores are basically code for delicious cookie sandwich with dulce de leche in the middle. They’re a popular confection in Spain and parts of Latin America. They’re delicate cookies made with corn starch that give a buttery, satin texture with the perfect amount of crumble. I love alfajores (and usually try to pick up a box of the fancy, individually-wrapped kind from Palacio de Hierro while in Mexico) but sometimes I just need a quick fix without the hassle of making cookies from scratch when I can’t buy the fancy kind. On the Kenmore Genius Blog, I confessed my dirty little secret on how to make alfajores with all of the flavor and hardly any of the work. If you’re a disaster in the kitchen, are pressed for time with a busy schedule or just having a lazy moment, this recipe is for you! It’s so easy, you’ll wonder why you never thought of it yourself…. Cochinita pibil is a traditional dish from the state of Yucatán that’s cooked in an oven made inside a hole in the ground (called a pib). But did you know you can make a really good version of this dish in a slow-cooker? When I found out that January was National Slow-Cooking Month, I knew exactly what recipe I was going to adapt for Crock-Pot cooking. I’ve always wanted to test my theory that cochinita pibil can be done in a slow-cooker, so the fact that it was a nationally recognized month-long culinary holiday-of-sorts was the perfect chance to take on the challenge. 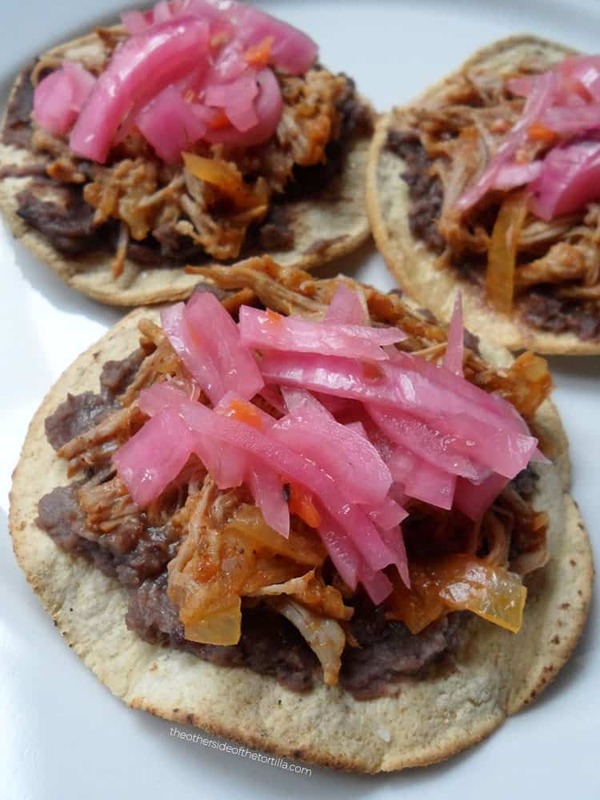 Yes, we’ve posted a recipe here before for cochinita, but let me tell you why this one is different. 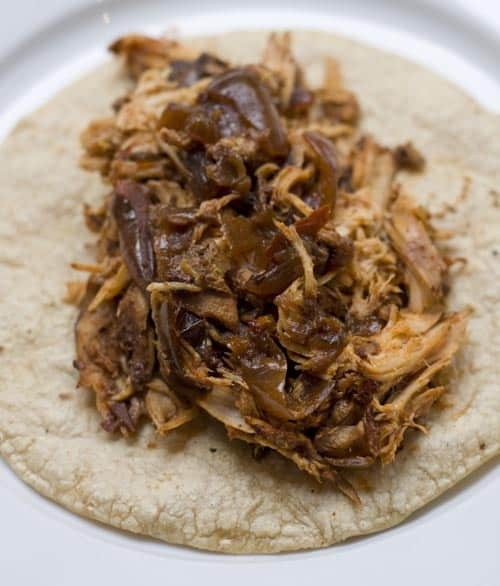 We’re using a different cut of meat (boneless country-style pork ribs), an easy spice mix made from scratch (no achiote paste in brick-form here), and as with most slow-cooker recipes, you can set it and forget it, making it relatively hassle-free compared to the traditional method of making cochinita pibil. If you’re making it for guests, you can still serve it wrapped in warm banana leaves to impress them. Just check out our original recipe for cochinita pibil for directions on how to heat the banana leaves so they’re pliable. And finally, we’re not going to serve our cochinita pibil as a taco like you might expect–we’re going to serve them on tostadas. This dish can also be served as panuchos by putting the refried black beans inside little tortillas, frying before adding the meat, salsa and any garnishes on top, but trust me when I say store-bought tostadas are going to save you a lot of time. Plus, this recipe is a bit healthier because we’re leaving the frying out. If you can’t find small tostadas or picaditas at your grocery store, you can make your own by either heating corn tortillas in the oven until they’re dry and crispy, or you can get the same result by cooking them longer on your comal. But before we move on to the recipe, let’s talk a little about what a slow-cooker (or Crock-Pot) actually is so there’s no confusion because I often get asked if a slow cooker is the same as a pressure cooker. (The answer is no. In fact, they’re opposites.) A slow-cooker is a counter-top electric device that you plug in and usually has a removable glazed ceramic or porcelain pot, surrounded by a heat-conducting housing. They typically have two cooking settings: low or high, and a keep warm setting. Some of the more expensive slow-cookers have more options for controlling the heat as well as a timer with an automatic-shut off. The point of a slow cooker is to cook things with steady low, moist heat which makes it ideal for soups, stews and cooking meats that you want to be fork-tender, but without all the fuss of watching it constantly. The lid of the slow cooker typically has a small vent in order to let some of the steam escape and can be removed during the cooking process to stir the ingredients if needed. So now that you know the difference, let’s get slow-cooking. Use your Crock-Pot or slow-cooker for a no-fuss, easy-cleanup variation of a classic Yucatan favorite, cochinita pibil. Tip: Serve on mini tostadas for a perfect party-treat! THE NIGHT BEFORE: MARINATING THE MEAT - Start by squeezing the fresh lime juice and orange juice. Once you have the juice, put it in a medium to large glass bowl and add the crushed garlic. It's important to use glass rather than metal/stainless steel or plastic because glass is non-reactive and non-corrosive. Combine all the dry spices and mix well; then add vinegar and olive oil. Stir to incorporate the liquids and add to the glass bowl with the citrus juices and garlic. Stir well and add the pork to the bowl, making sure it’s completely covered by the juice. Cover and allow it to marinate overnight in the refrigerator. Making the salsa: Slice 1/2 of a large red onion into small strips and mix it with the juice of 1 orange and 2 limes. Roast one habanero on your comal or in a skillet, remove the stem (and seeds if you want to reduce some of the heat), and finely chop. Add the habanero to the salsa. Store in an airtight container in the refrigerator overnight. THE DAY OF: Slice the remaining half onion into quarter-inch thick slices and place them on the bottom of the crock-pot. Remove the meat and marinade from the refrigerator and place the meat over the onions. Pour all the juice over the meat. Place the lid on the crock-pot and cook on high for 5 hours (or on low for 8-9 hours). You should NOT rush and cook this recipe on high heat for half the time - it doesn't work that way! You'll end up with tough meat. You’ll know it’s finished cooking when you remove a piece of meat from the crock-pot and can shred it with a fork without much effort. Shred all the pork. 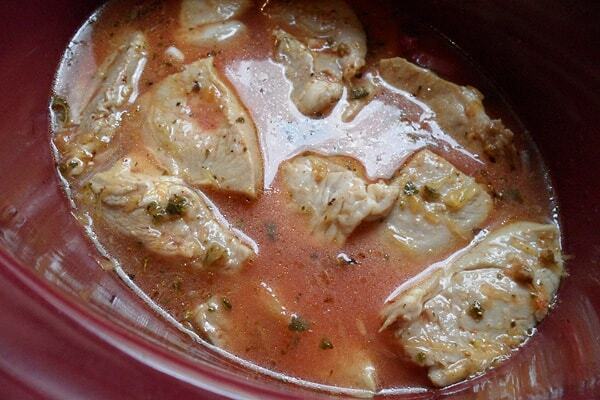 Place the meat in a bowl and add a little juice from the Crock-Pot to keep the meat moist. Heat the tostadas in the oven at 200º F for a few minutes. Spread warm refried black beans on the tostadas. Add the shredded pork on top of the beans and spoon some of the habanero salsa and onions on top of the pork.